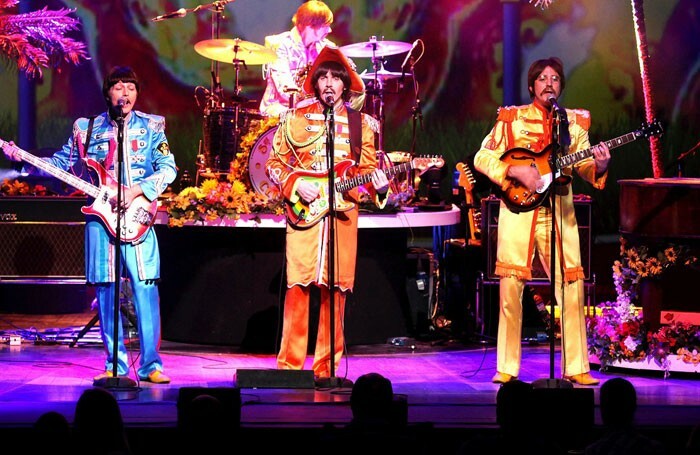 This tribute to the Beatles, efficiently packaged by Annerin Productions, has held on to its original West End cast from 2012 for this latest UK tour. Two sets of Fab Four impersonators perform in rep, blasting out a show’s worth of greatest hits and using the irresistible force of the jukebox musical to charm their audience into beaming, nostalgic submission. Visually, the show blossoms from the early, black and white days of that ‘best of cellars’, The Cavern, when the quartet were in perky mop-top mode, to the colour-drenched regalia of the Sergeant Pepper years, and beyond. As the four players get hairier, the light show gets trippier; reaching its apotheosis in their rendition of Lucy in the Sky with Diamonds, which is like being inside a lava lamp. There’s more than a whiff of caricature to the performances: Luke Roberts as Ringo, tossing his 1963 barnet and adopting the Thomas Tank Engine drone when called upon to speak, raises a smirk and Iain Hornal has a good line in McCartney mannerisms, but the slightly stilted quips between numbers are thankfully kept short. The four accomplished musicians recreate an unmistakable sound, adroitly tugging on the heart strings in the process with tenderly unplugged renditions of tearjerkers Yesterday and Blackbird. Television monitors above the stage, playing quaint 1960s advertising and newsreels complete the effect. Though not the most imaginative premise for a stage show, a production that can get a middle-aged audience to stand up and wave their phone torches in the air while singing along is clearly doing its jukebox job just right.